SOF News Update 20181101 – Social media, SF officer assignments, Saudi Arabia, Norway’s Marinejegers, integrating females into NORSOF, Afghan elections, social media training in the military, grey zone in a maritime environment, masculinity and close combat, best practices in the intelligence community, Gen Miller on Afghanistan, improving SOF measurements of effectiveness in security cooperation, Jeff Goodson on China’s infrastructure development around the world, SOCOM and visual tech, and more. SF Officer Assignments. MG James Kraft will be assigned as director of operations for the United Nations Command / Combined Forces Command / US Forces Korea. Colonel (P) Kevin Leahy will be assigned as deputy commander Special Operations Command Central (SOCCENT) at Tampa, Florida. Integrating Females into NORSOF. Read an excellent article about the reasons Norwegian special operations forces should introduce female Special Reconnaissance (SR) operators into the force. While the inclusion of women may “. . . lead to a slight reduction of some aspects of the existing capacity . . . ” it will provide a noticeable benefit to the existing SR capacity. Read “Defying Stereoptypes: The Untapped Potential of Integrating Female Reconnaissance Operators into Small State NATO SOF”, Small Wars Journal, October 31, 2018. USASOC and Workers with Disabilities. The United States Army Special Operations Command has a large number of employees with disabilities that contribute to the success of the organization. Read “USASOC celebrates National Disability Employment Awareness”, Army.mil, October 31, 2018. USSOCOM and Visual Tech. November 14th is Optical Dominance Industry Day where USSOCOM will provide companies with an opportunity to showcase technologies that USSOCOM could deploy. Read “SOCOM wants to outfit warfighters with futuristic visual tech”, FedScoop, October 31, 2018. Improving SOF Metrics in SC. Matthew Coburn says USSOCOM should implement changes in education and training to improve the capacity of US SOF to assess and plan for security cooperation activities. (Special Operations Journal, Oct 30, 2018). Saber Junction 2018. September saw US, NATO, and partner SOF working with conventional forces at the Joint Multinational Readiness Center (JMRC) at Hohenfels, Germany. (Army Recognition, Oct 30, 2018). Retired SF General Now Helps Veterans. Major General (Ret) David Burford spent almost 40 years in the U.S. military; much of that time in Special Forces. Now he devotes a lot of time with veterans – providing support ‘by, with, and through others’. Read his story in Over the Mountain Journal, November 1, 2018. 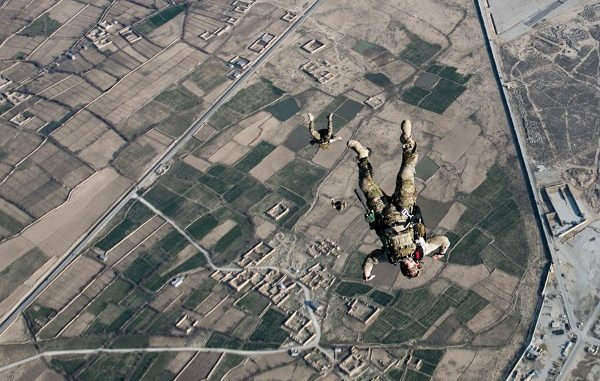 Managing Risk and SOF. T. Nelson Collier, a retired Marine officer, takes a look at the US engagement in northern Africa and the challenges that presents. He believes the nation’s national security staff needs to give AFRICOM and SOCOM a clearer strategy for the Sahel. Read “Special Forces at the Lion’s Tail: Managing Risk in the Use of Special Operations Forces and the Application of Law”, Small Wars Journal, October 2018. Norway’s Marinejegers. A researcher at the Norwegian Defense Research Establishment (FFI) has penned an article about the Norwegian Naval Special Operations Commando or Marinejegerkommandoen “A Small State’s Special Operators, Up Close”(MJK). Read her article at , War on the Rocks, October 25, 2018. Saudi Arabia. The drama with one of our biggest supports in the CT fight continues. The recent killing of a journalist in a Saudi embassy in Turkey has relations between the US and Saudi Arabia in a state of flux. The drama has highlighted the U.S. support that is provided to Saudi Arabia in its involvement in the Yemen conflict. Support for the Saudi fight in Yemen is diminishing. High level U.S. officials have stated that it is time for a ceasefire in Yemen and that a political solution is the way forward to end the conflict and humanitarian crisis. Syria Update. The Syrian Democratic Front (SDF) has temporarily suspended offensive operations against the Islamic State in response to cross border attacks by Turkey. While the U.S. would like to have the regional actors concentrate on ISIS it seems that other nations are concerned with other matters – such as increasing their area of influence and control in Syria. AFCENT Airpower Summary for Sep 2018. The U.S. Air Force continues its continued air support to U.S. and partner nation forces in Iraq, Syria, and Afghanistan. (AFCENT, Oct 31, 2018). Russia Is Not Happy. The NATO Trident Juncture exercise is in full swing – taking place principally in Norway but including the two non-NATO nations of Sweden and Finland. And Russia is miffed. (Business Insider, Oct 25, 2018). The Gerasimov Doctrine. Russia is developing its military doctrine for hybrid warfare based on their experiences in Syria and Ukraine. Russian military journals are highlighting the significant doctrinal changes within the Russian military that may be implemented at the institutional level. Read more in Russia in Review: The Gerasimov Doctrine Is Here to Stay, Institute for the Study of War, October 30, 2018. ISIS in Philippines. It has been a year since the battle for Marawi finally ended. So what’s become of the ISIS-linked groups in Mindanao? (The Diplomat, Oct 25, 2018). Big Infrastructure, Geopolitics, and China. Jeff Goodson, a retired U.S. Foreign Service officer, notes that “. . . China is building core economic infrastructure in some of the world’s most strategic places . . .” and poses a geopolitical threat to the West. Read more in “The Return of Big Infrastructure as a Geopolitical Tool”, Real Clear Defense, November 1, 2018. More on China. William Pacatte, a Military Fellow with the International Security Program of the Center for Strategic & International Studies, believes that China’s Belt and Road Initiative poses a “. . . significant long-term strategic threat to U.S. interests that now spans across the globe.” Read “Be Afraid? Be Very Afraid? – Why the United States Needs a Counterstrategy to China’s Belt and Road Initiative”, CSIS, October 19, 2018. Summary of Parliamentary Elections. Vanda Felbab-Brown, a Senior Fellow at the Center for 21st Century, provides a summary of the recent parliamentary elections held in Afghanistan. Read “Ballots and Bullets in Afghanistan”, Brookings Institute, October 23, 2018. Helicopter Crash. An Afghan Air Force helicopter crashed in the western province of Farah killing more than 25 personnel who were on board. The dead include the deputy commander of the 207th ANA Corps and several other senior military and government officials. (Radio Free Europe, Oct 31, 2018). 2nd SFAB to Afghanistan in Spring. The 2nd Security Force Assistance Brigade will relieve the 1st SFAB this coming spring. It won’t be a smooth transition as the 1st SFAB would have already left country. There will be a bit of a gap it seems. Some media reports say that members of the 1st SFAB will accompany the 2nd SFAB back into Afghanistan for the first 30 days to ease transition. Not a bad idea. Seth Jones on Afghanistan. Without a political settlement between the Afghan government and the Taliban a U.S. withdrawal from the conflict involves great risk. So says Seth Jones in “The U.S. Strategy in Afghanistan: The Perils of Withdrawal”, Defense 360 CSIS, October 26, 2018. Grey Zone in the Maritime Domain. James Goldrick explores the challenges facing Australia from hybrid activities conducted by China in the maritime arena. Read “Grey Zone Operations and the Maritime Domain”, The Strategist, Australian Strategic Policy Institute (ASPI), October 2018. Masculinity and Close Combat. The terms “hyper-masculine” and “toxic-masculinity” are being used more frequently by advocates who wish for a speedier integration of women in the combat arms. Franklin Annis, a veteran of Operation Iraqi Freedom, provides his perspective on the topic in “Ground Close Combat is Masculine”, Wavall Room, October 30, 2018. Social Media Training in the Military. One of the constant challenges in the military is how to train military personnel in social media. Ric Cole, a UK consultant in military info ops, provides his perspective on the topic in a recent article posted on Medium.com (Oct 30, 2018). Gray Zone Conflict. The Center for Strategic & International Studies (CSIS) provides – in a Q&A format – an explanation of conflict in the “Gray Zone”. Read Competing in the Gray Zone (Oct 24, 2018). Mattis with the USIP. Secretary of Defense Mattis spent some time with the United States Institute for Peace where he was interviewed about U.S. national defense strategy and conflict areas around the world. He spent some time on the R4&S strategy for Afghanistan. Some interesting comments in the transcript. (DoD, Oct 30, 2018). See also a news release by DoD. Army Pivots to Major War. The Army is shifting to fight the ‘big war’ with potential near-peer adversaries (Russia, China, etc.) but it will likely be engaged in peacekeeping, stability, and counterinsurgency operations in future conflicts. In an effort to free up Brigade Combat Teams (BCTs) for training for high-end conflict the Army has established the Security Force Assistance Brigades (SFABs) to conduct the security force assistance mission. Read more in an article by Sean Naylor entitled “After Years of Fighting Insurgencies, the Army pivots to training for a major war”, Yahoo!, October 30, 2018. “We think the United States Army in particular but the military writ large will be in an advise-and-assist role for years and decades to come”. (Milley). Best Practices in the Intel Field. Dr. Debora Pfaff, with the National Intelligence University, says that ‘best practices’ and ‘checklists’ are useful but limiting. Read “Boxed In: The Bad Side of Best Practices in Intelligence”, War on the Rocks, November 1, 2018. Perspectives on Terrorism. The October 2018 issue is now posted. Articles cover terrorism and terrorist groups in Libya, China, Spain, Southeast Asia. Some reviews on new books and a listing of informational resources about terrorism. Video – The Tip of the Spear: From Virginia Hall to Gina Haspel, The OSS Society, October 29, 2018. A 15 minute long video about women in the intelligence community starting with the women in the OSS to the current director of the Central Intelligence Agency. The OSS was the forerunner of the CIA and U.S. Army Special Forces. Threat Assessment. The Texas National Security Network held a panel discussion that included John Brennan (former CIA), Richard Engel, William Inboden, Adm (Ret) William MCraven, and Nicholas Rasmussen. An hour long audio presentation on changes to the threat assessment process after 9/11. (War on the Rocks, Oct 30, 2018). 10th SFG Halloween Video, 10th Special Forces Group DVIDS, October 31, 2018. Someone at Fort Carson decided to have a little bit of fun with his video production skills. Watch a fun 30-sec clip. Photo: U.S. Air Force PJs and combat rescue officers conduct a HALO military free fall jump working with a C-130J Super Hercules flown by the 774th EAS. Photo by Tech Sgt Gregory Brook, ARCENT Combat Camera, Afghanistan, March 12, 2018.